This Podcast: Learn tips, tactics, and hacks to stay productive and make the time for social media success! Productivity struggles? If you’re overwhelmed with the maze of social media and struggling to manage it all, it’s totally understandable! Staying productive means begins with a strategy to help you focus. 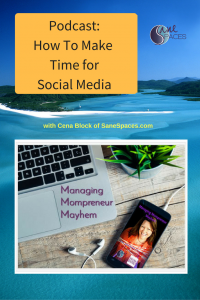 So when you spend time focusing on high payoff tasks that make social media successful for mompreneurs, you’ll be able to leverage your part-time business and make the most of your online time. This is a great show for mom entrepreneurs. With everything else busy moms need to juggle, how do people find time for social media? Social media has crept into our lives and is the least expensive way to multiply your brand message. It’s a wonderful way to get out there and be sure your ideal clients know where to find you. But, how can you find time to get it all done? Tune in to this episode to learn planning strategies, shortcuts, tips and productivity hacks that make your time spent on social media efficient, and help straighten out the best ways to be more effective with your social media presence. This episode will help you get clear on social media and make it much easier to manage!